The Ecole communale n°7 (rue Haute 255, in the block just next to the Vieux Marché) opened in 1897, at the time of the progressive liberal mayor Charles Buls (1837-1914, mayor in 1881-1899), in order to provide primary education to the many illiterate boys growing up in the working class neighbourhood of the Marolles. It is still a Francophone communal school today under the name "Ecole Baron Steens" (Louis Steens was a liberal échevin at the end of the 19th century), which it was given in 1975 after a merger with the Ecole n°15 for girls (rue Haute 107), just opposite the house in which Breughel is believed to have painted in 1563 his two famous Babel towers (rue Haute 132). 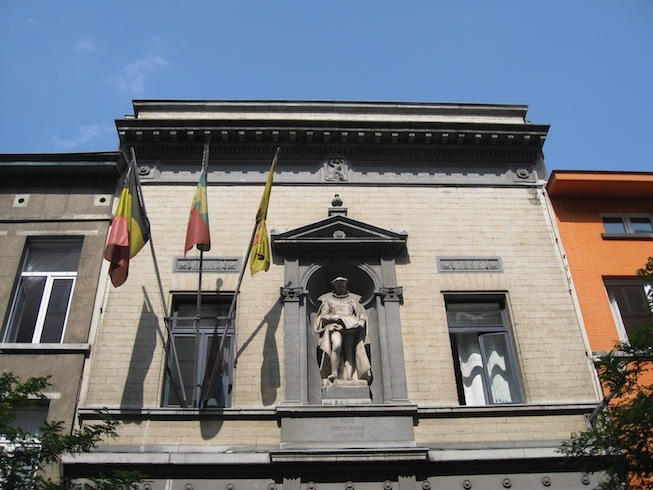 The front of the school features a large statue of "Marnix de Ste Aldegonde" holding a book, with underneath the Latin inscription "Ratio instituendae juventutis", the title of the book in which Marnix pleads for immersion schooling and the early learning of several languages — at least for the children of princes and noblemen ("principium ac nobilium puerorum", says the rest of the original title, omitted under the statue). For over a century, Marnix has been waiting for us with his book in his hands, at the front of a school in one of the poorest neighbourhoods of Brussels, no doubt hoping that some Brusselers would one day get the hint and launch a Marnix plan relevant for all Brussels children, not least those now living in the Marolles.